600 g paraffined bricks, 10 kg polymeric bucket. 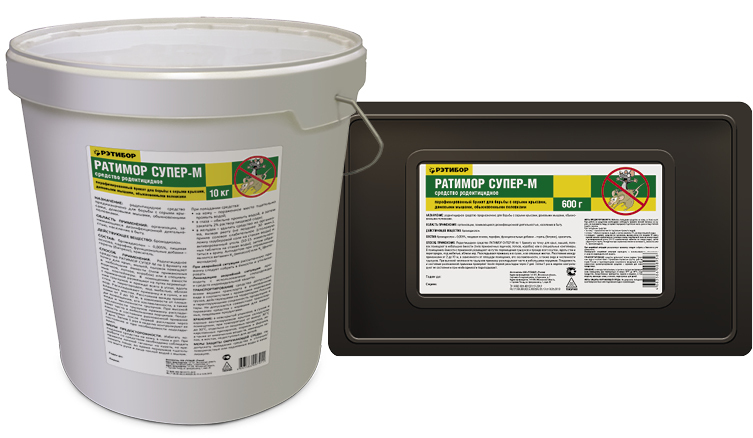 Ready-to-use additive intended against gray rats, house mice and common voles in resident premises of various installations, open areas bordering upon built-up territories of a populated place. Used by disinfecting agencies and in private life. It contains 0.005% bromadiolone as an active ingredient. 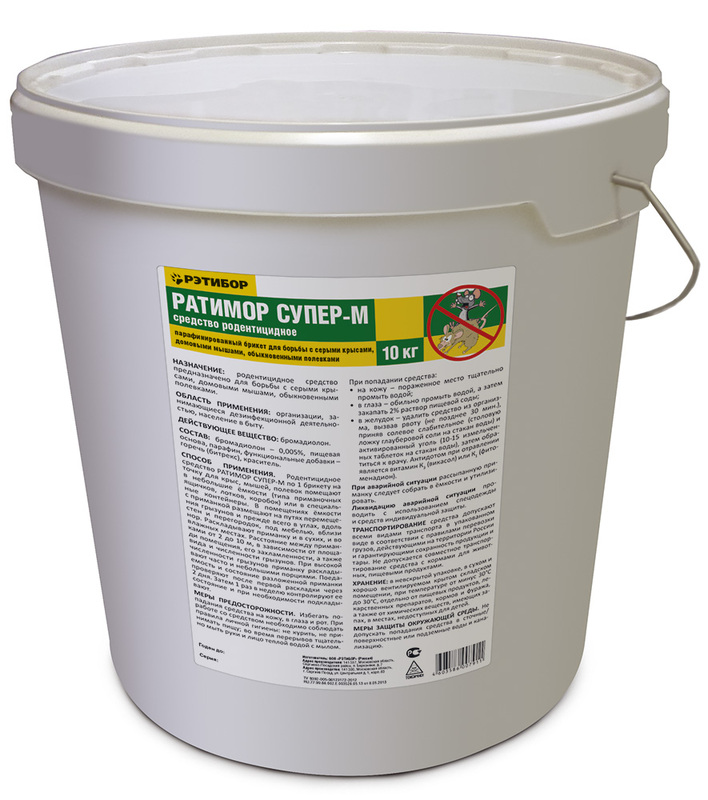 Place 1 brick of RATIMOR SUPER-M per 1 lay out point for rats, mice and voles. Insert it in small containers (for example, baiting boxes, beds and cartons) or in special ones. Lay out baits in inhabitants of rats and house mice. Indoor location: place containers with bait on rodent motion paths (in corners, along the walls and non-load-bearing partitions, under furniture and near holes). Place bait in dry and moist areas. Depending on premise surface, dirtiness, rodent number and type, a distance between baiting points is 2-10 m. Due to high number of rodents, bait is located by small portions on frequent occasions. Control palatability and status of placed bait in 2 days after the first lay out. In future control availability and status of a bait a week apart. Add or replace bait portions according to eating or contamination. Stop control and lay out of the product if it remains intact everywhere for a long time suggesting rodent disappearance. Only persons above 18 years old who have passed special instruction and do not suffer from blood and hepatic diseases, are allowed to perform this operation. During weighing, raw material feeding and finished product dispensing perform processing using work wear (coat or waterproof and dustproof overall, hooded cap) and personal protection equipment (rubber gloves, antidust respirator, apron, safety shoes and goggles). Avoid contact with skin, mouth and eyes. Perform all operations with the product in designated areas with effective forced-air-exhaust ventilation or in ventilation hood. Authorities and personnel of installation to be processed, as well as persons living nearby must be informed about presence of rodenticide and toxicity degree observing appropriate precautions. Observe personal hygiene rules during work, such as: do not smoke or eat; carefully wash your hands and face with warm water and soap during breaks and after use; take a shower and change clothes after work. After work clean your work wear from dust. Wash it at least weekly. Place product in designated containers (baiting boxes, tubes, beds, trays or special containers) with special forceps (spatula) in order to exclude product dissemination by rodents and entering the environment (food, water, household items etc.). Number poisoned bait lay out points in order to carry out more accurate control and accounting. Keep out of the reach of children and domestic animals in areas of use. Special precautions are required to use this product in therapeutic and child care institutions, as well as in catering establishments. When used in installations, place bait in designated baiting boxes in order to avoid product dissemination by rodents and entering food and household items. After termination of deratization arrangements collect remaining useless bait and dead bodies in containers and discard (bury to a depth of 0.5 m or burn in the open air). Countryside: bury package, containers and non-reusable remaining product to a depth of 0.5 m at least (or burn) in designated areas far away from water. Urban settlements: discard all above mentioned stuff on a contractual basis with specialized organizations. Countryside: bury dead rodents to a depth of 0.5 m at least (far away from water) previously covering with bleach powder. Urban settlements: discard dead animals on a contractual basis with specialized organizations. Do not use package or product containers in other purposes. Store prepared poisoned baits in intact labelled package in special locking cabinet intended for storage of pesticides or in warehouses (labelled as "TOXIC!") at 0-35°С. Register inflow and discharge of the product. Collect spillage entered ambient environment and refer to disposal. Remove product using work wear (rubber apron and boots) and personal protection equipment. During transportation and storage packages must be labelled and closed tightly. Do not store the product or bait near chemical substances with powerful odor. Regularly control bromadiolone level in aerial environment of premises where baits are prepared and dispensed. Maximum permissible concentration in work area is 0.01 mg/cubic meter, hazard category I (extra-hazardous, aerosol with skin protection note). Periodical inspection is specified as per 12.1.005 All Union State standard. 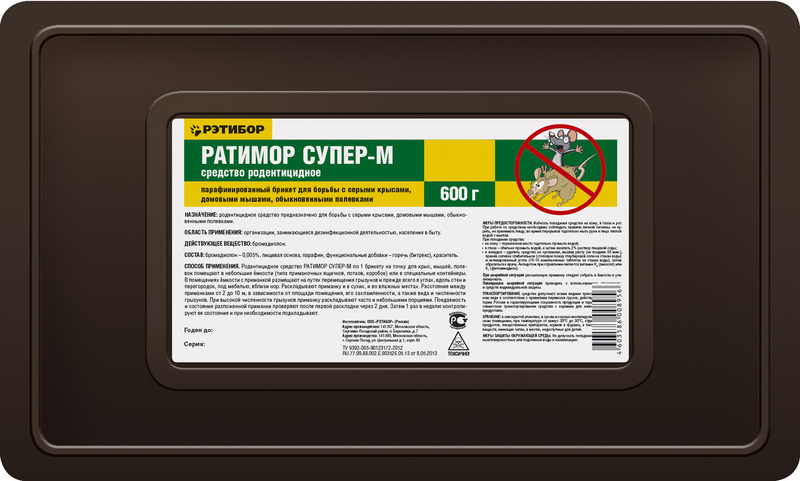 Store in intact package bearing ''TOXIC'' label in special locking cabinet / safe or dry well-ventilated closed warehouse at -30…+30°С separately from food, animal feeding, forage and odorous chemical substances under strict control. Register inflow and discharge of the product.